The SUMMIT provides a forum for collaboration, communication and coordination. It is an exciting time to be a singer--especially of barbershop harmony--indeed! 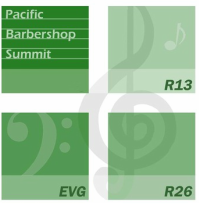 The Pacific Barbershop Summit represents the members of Evergreen District of the Barbershop Harmony Society, and Region 13 and Region 26 of Sweet Adelines International. The Summit is a collective of northwest men’s and women’s barbershop activities that encompass a harmonious community of education, communication, promotion, camaraderie, and...did we mention singing? Sharing this wealth of knowledge within the two groups has been, and will always be, a priority for the Pacific Barbershop Summit. Inspired by Benjamin and Rosamund Zander's book and video, Leadership: The Art of Possibility (click here for the video), Kevin Kelly and Kendall Williams--two long-time barbershoppers--saw a new opportunity to unite efforts regarding their favorite musical hobby: barbershop singing. They’d noticed that for many years duplicated efforts, miscommunicated information, and conflicting weekend events were common between the men's and women's organizations. The Pacific Barbershop Summit emerged with these goals in mind: bringing male and female barbershoppers together to work on supporting each other and building their art form together. In 2005, leaders of Sweet Adelines International Regions 13, 26, and 24 (merged later), plus the Evergreen District of the Barbershop Harmony Society, gathered in Bellevue, WA for the first meeting. The Summit Directors--two from each Region, six from the District, and three more appointed positions--meet twice a year. Building harmony through cooperative sharing of knowledge, skills and resources to supplement the programs and activities of the Evergreen District of the Barbershop Harmony Society (BHS) and Regions 13 and 26 of the Sweet Adelines International (SAI), and other a cappella organizations. This all means that while the Regions and the District remain independent entities, the Summit provides a forum for collaboration, communication and coordination. It is an exciting time to be a singer--especially of barbershop harmony--indeed! One of the educational activities which the Summit wholeheartedly supports is Harmony College Northwest (HCNW). Harmony College Northwest is held on the University of Puget Sound campus in Tacoma, WA. Men and women (of all ages) attending classes--led by experts from both organizations--this is a true collaborative effort that the Summit is proud to support. For more information about Harmony College Northwest, visit the website today. Representing the members of the Evergreen District of the Barbershop Harmony Society & Region 13 and Region 26 of Sweet Adelines International.